The big British banks have a loan book that is over 165% of GDP and pay a dividend of over 3%. Credit creation is still growing the loan book at 3% of GDP. Coming central bank rate rises will cause the interest income from the accumulated loan book to cause automatic income increases to banks on outstanding loans. The central bank and government stand behind the too-big-to-fail banks and stand ready to assist them in a crisis should 2007-09 repeat. The purpose of this report is to assess if the big British banks are worth investing in for continued share price capital growth and dividend income. To answer this question, an assessment of the success to which the banks have enclosed the economy with debt will be used together with an assessment of how this enclosure of the economy can be made into higher profits. This is all the more important since my last article on this subject as we now have a central bank rate rise on the books and we can now assess the likely impact of this rate rise on bank profits. The chart below shows the level of private credit creation entering the private sector through commercial banks. The above chart shows that credit creation from private banks in 2017 added $US151B to the economy or a very strong 5.75% of GDP. This is a strong result that is not likely to be repeated in 2018 as the stock of loans peaked in the first quarter of 2018 and fell in the second quarter of 2018 and is unlikely to add to money flows as strongly in 2018 as in 2017. The chart above shows the money supply has stopped growing and is oscillating around the GBP2.8T mark. 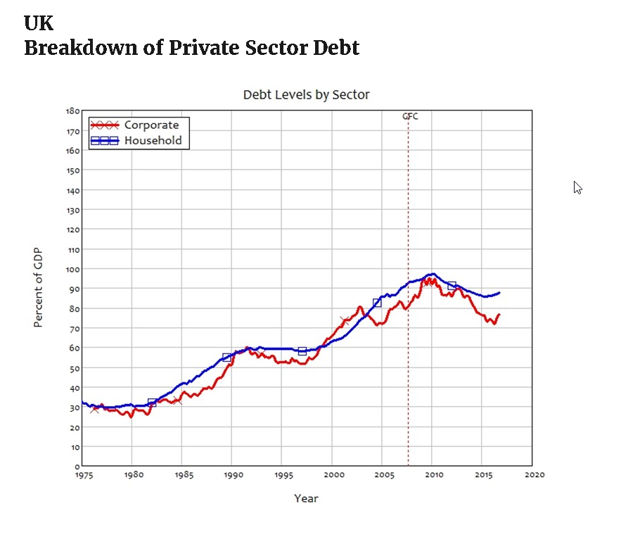 The flow of credit adds to the stock of private debt in the economy, and this debt is shown in the chart below. The chart above shows that Britain has a high private debt level of 165% of GDP. Debt peaked at 190% of GDP at the peak of the GFC. Both corporate and household debt is exceptionally high and goes hand in hand with Britain's expensive real estate. The bulk of the private household debt is for home mortgages for a place to live. What this means going forward is that one cannot expect Britain to be able to sustain a bull run fueled by credit money given that it has reached what can be considered a full debt capacity. Professor Steve Keen's studies show that economies with private debt levels of 150% and over tend not to become more indebted. They hit a natural barrier where no more debt is demanded. The reason is that such a large percentage of aggregate demand goes to debt servicing that there is a noticeable drop in the demand for real goods and services. Production goes unsold and is cut back; this leads to job losses, income losses and a further cessation of aggregate demand until the debt is repaid or written off and more income can be spent on buying production rather than servicing debt. This phenomenon where debt service absorbs so much aggregate demand that it stalls the real economy has been coined "debt deflation" by economist Professor Michael Hudson. This is in the sense that the real economy is deflated by the weight of the debt service. Loan as much money out to creditworthy borrowers as possible. Seek to create a rising rate environment to maximize profit on the established loan book for as long as possible. A three-stage process where the economy is first enclosed with loans and then squeezed to extract as much income as possible. One can assess how successful a bank is by looking at how large its loan book is and how much of the economy's income it has secured as an income stream on that loan book. In the case of Britain, the banking sector has been very successful as the charts above show. The debt once reached 190% of GDP, and this shows what is possible. In 2017, the stock of debt expanded a further 5.75% of GDP but in 2018 has started to roll back. Mission accomplished, it is over 165% of GDP. The loan growth rate has now reached zero and has started to roll back and the only method now available to grow bank profits is to seek a general rate rise via the central bank, like in the U.S.A. It is time for UK bankers to move onto stage 2. For Britain, one can model the impact of this private debt on the economy over a range of interest rate levels, and this is shown in the table below. The standard home loan in Britain is a variable rate at one to three percent. Rates are not fixed for 30 years like they are in America. The longest fixed rate loan one might get is for five years, and these are not common. Central bank rate rises will therefore automatically be passed on to customers via their variable rate loan after a relatively short time. One can see at present that over almost 5% of GDP/aggregate demand goes to private commercial banks as debt service cost and not on real goods and services in the real economy. One can also conclude that this interest payment from loans underpins the strong dividend income one can receive from British banks. The largest bank, the HSBC Holdings PLC (HSBC), shown in the chart below, yields a dividend of better than 4.2% and a stable share price over the one year shown in the chart. Lloyds and RBS needed rescuing by the national government in the GFC. Lloyds has a dividend again, and a healthy at that, but RBS still has not and is not allowed to issue dividends until the terms of the rescue are met. Bank profits and dividends can be expected to rise with central bank (BOE, Bank of England) rate rises and bank exits from rescue packages, ten years should be long enough. The first long awaited rate rise has recently occurred, and is shown in the chart below. Rates were considered too low at only 0.5% and are now 0.75% and the wish is to "normalize" them to at least the long-term average of 2% to 3%. Such a scenario would see home loan variable rates increase to 3% to 5%. By this time, banks will be earning about $151B of extra income per year. This is about twice the loan book earnings at present. This is based on the loan book remaining static with no extra effort on behalf of the banks to generate more loans. The dividend could potentially more than double given the cost base is the same, and yet the rising rates have brought in more income. From the table above, one can see that each one quarter percent rate rise adds over US$10B to bank sector income. HSBC appears in the top ten list of the largest banks in the world by market capitalization as the chart below shows. The other three are not far behind. This is extraordinary given that Britain has a population of 65 million people. It is like California and Texas joined together yet we see no State banks in the lineup. 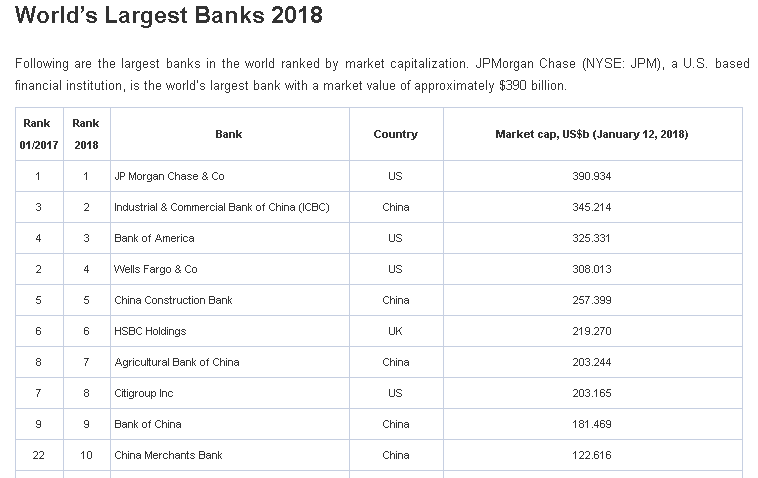 American banks feature in the list and they should as America is much larger than Britain for population and GDP firepower, as is China. Britain, like Australia, and Canada is punching above its weight in banking. 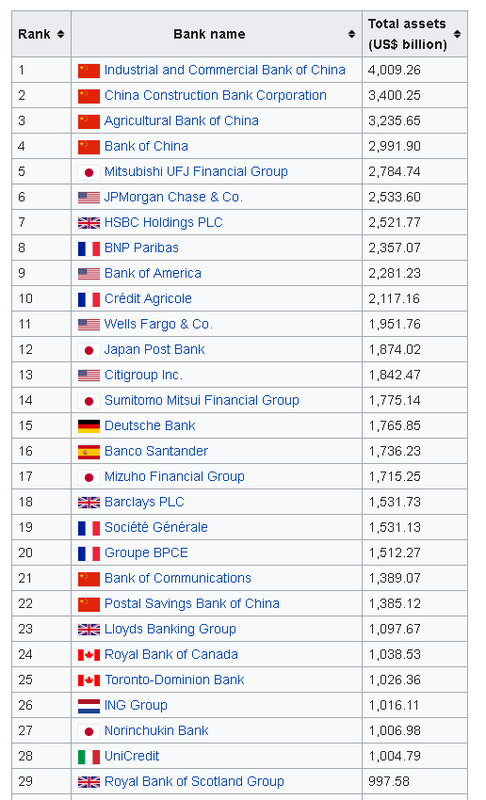 By largest bank by assets under management (size of loan book), all four of the British banks feature in the top thirty banks in the world as the chart below from Wikipedia shows. In the last version of this article, the banks have improved their relative positions overall and have moved out of the list of the top 50 and are now in the top 30 by assets under management. What this goes to show is that the British banks are "too big to fail." When another financial crisis occurs due to profligate, irresponsible lending the "too big to fail" card will be played again and will work as it did in 2006-2009. Back then, national governments across the world guaranteed bank liquidity. The banks are backstopped by the national government which is sovereign in its currency and therefore has unlimited British pounds to create from its central bank computer. The financial sector has well and truly captured the national government and the central bank and is in a good position to dictate both fiscal and monetary policy. A long-term buy and hold investor cannot lose. The British banks have enclosed the economy with a loan book of over 165% of GDP, and it has stopped growing after a record growth spurt of over 5% of GDP in 2017. The next phase is harvesting interest income from this loan book asset; this has started with the central bank raising the interest this month by 0.25%, and this adds US$10B to bank income from interest rate income. The big British banks are too big to fail and are backed by a monetary currency sovereign with the unlimited ability to issue British pounds; they have been rescued once and will be rescued again.